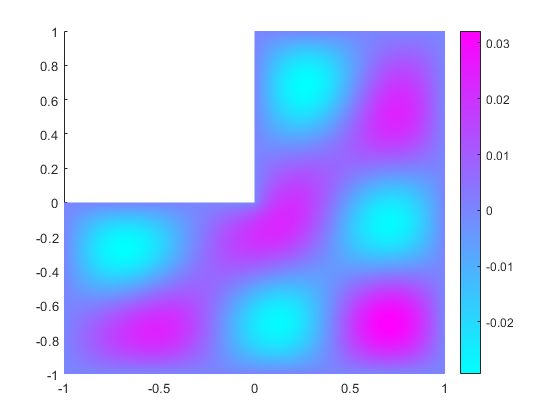 An EigenResults object contains the solution of a PDE eigenvalue problem in a form convenient for plotting and postprocessing. Eigenvector values at the nodes appear in the Eigenvectors property. The eigenvalues appear in the Eigenvalues property. Solve an eigenvalue problem using the solvepdeeig function. This function returns a PDE eigenvalue solution as an EigenResults object. This is the recommended approach. Solve an eigenvalue problem using the pdeeig function. Then use the createPDEResults function to obtain an EigenResults object from a PDE eigenvalue solution returned by pdeeig. Note that pdeeig is a legacy function. It is not recommended for solving eigenvalue problems. Solution eigenvectors, returned as a matrix or 3-D array. The solution is a matrix for scalar eigenvalue problems, and a 3-D array for eigenvalue systems. For details, see Dimensions of Solutions, Gradients, and Fluxes. Solution eigenvalues, returned as a vector. The vector is in order by the real part of the eigenvalues from smallest to largest. Obtain an EigenResults object from solvepdeeig. Create the geometry for the L-shaped membrane. Apply zero Dirichlet boundary conditions to all edges. Specify coefficients c = 1, a = 0, and d = 1. Create the mesh and solve the eigenvalue problem for eigenvalues from 0 through 100. Plot the solution for mode 10.